The Jewish Art Salon and the Educational Alliance in New York will host a session in conjunction with Tobi Kahn’s exhibit Embodied Light, 9-11 in 2011 at the Ernest Rubinstein Gallery. Salon members and the general public are welcome to attend that night to view Kahn's exhibit, to share their 9-11 memories and bring their “memory block” to be displayed in a window installation. (more info on that below). Date: Tuesday September 13th, 6-8 pm. Tobi will discuss his exhibit; followed by those who wish to share their block and/or their memories of 9-11. Kosher wine and seltzer will be served. 197 East Broadway, New York, NY 10002. Between Jefferson and Clinton Streets. Jewish Art Salon members will contribute their own art / writing for an installation of memory blocks in the gallery windows on the Jefferson Street side, in concert with Kahn's exhibit. To be exhibited from September 14 – November 23, 2011. To participate in the exhibit, click here. 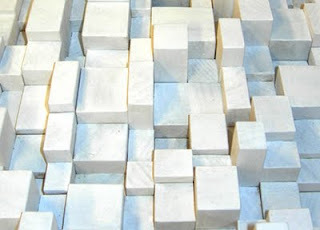 Kahn’s exhibit will feature 220 memory blocks, handed out by him to various New Yorkers and returned to him with a drawing or inscription that evokes their memory of the day. These blocks will be continually rearranged over the length of the exhibition. The Philadelphia Inquirer calls his work "perfectly balanced between extremes of abstract and representational.... having an uneasy mixture of authority and idiosyncrasy—and sometimes just a bit beyond human reach." A Facebook page, “Embodied Light,” has been set up to make it possible for new contributors to create virtual blocks, extending the project online.